Now sure, we've all taken our eyes off the road from time to time. We have to make a call, or text our BFFs, or perhaps eat a sandwich. 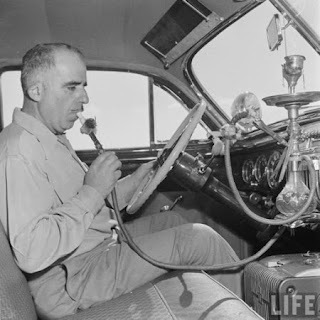 But if you're smoking your hookah while driving, there could be serious consequences. First of all, it could fall and make a mess. Who wants to be bothered with all that troublesome cleanup? And who wants all those burn marks on the upholstery? And as if that's not enough, if you get arrested you have to contact not only the DoE, but your principal as well. Do you really want to go through the hassle of explaining to the principal why you needed to do this while driving? The trouble with us Americans is we're too busy, and we always feel like we have to do a dozen things at a time. Let's relax a little, and take things one step at a time. Leave the hookah at home. Indeed, you may need it--because tomorrow it's back to work. And no, you may not bring your hookah to the classroom. That is frowned upon, and if you get caught they won't let you bring it with you to the rubber room either.